Tall people can still have fun: the XL guide to Singapore Airlines’ new A380s. 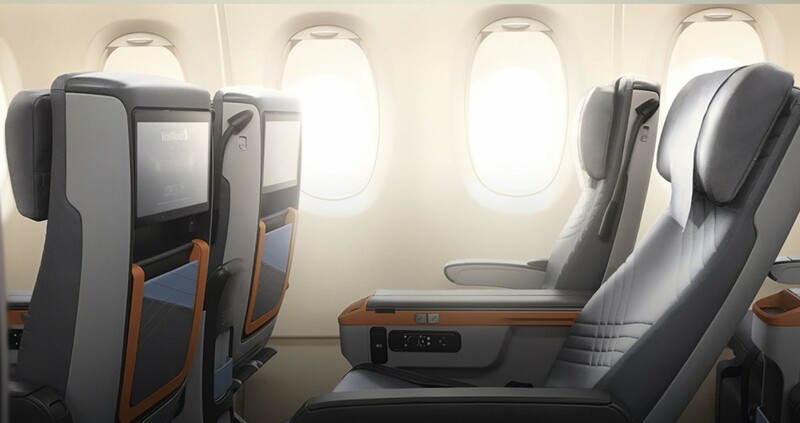 Premium economy on the Singapore Airlines' new A380. Image: Singapore Airlines. Tall people wanting to fly are facing a nightmare of diminishing legroom and narrower seats but carriers such as Singapore Airlines are not necessarily following the evil game plan. Singapore Airlines has generally been a friend to taller people and the $US850 million revamp of its flagship Airbus A380s happily maintains that tradition. The new product, the result of a four-year development program, will be on five new aircraft entering the fleet and and is being retrofitted to another 14 planes. AirlineRatings had the opportunity to test the not inconsiderable 6ft5in (197cms) frame of its editor against the Singapore product while one of the airline’s new superjumbos was on the ground in Sydney. And we were able to give it an XL thumbs up. 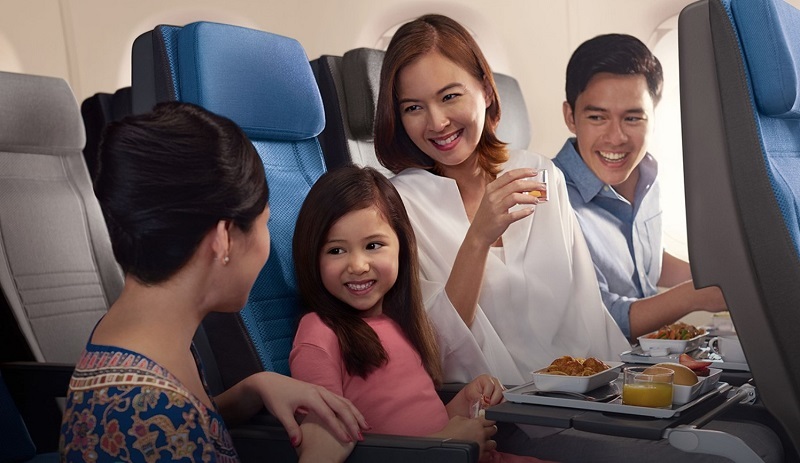 This wasn’t a full-product review, Singapore’s renowned service wasn’t on offer and cleaners were busy tidying up the plane before it was towed to the gate, but it gave a sense of the new 380 cabins in situ. 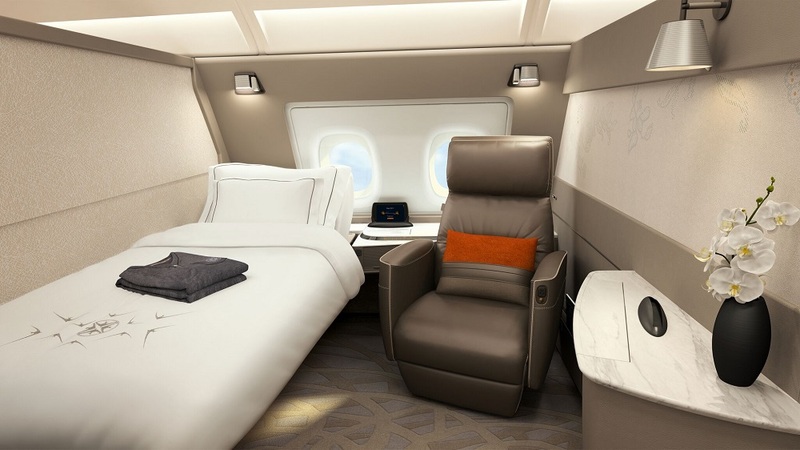 Singapore Airlines’ award-winning new Suites. Photos: Singapore Airlines. This is definitely Tall People Territory for those who can afford it. The six Suites in this stylish cabin at the front of the upper deck are designed to be the equivalent of small hotel rooms. The Incredible Hulk would fit in here with room to swing not just the proverbial cat but one of his superhero colleagues. Read: Singapore Airlines takes out major awards. There are three suites on either side of the cabin, each featuring a privace door. Partitions come down in the first two suites to enable them to be joined as one with a double bed for couples traveling together. This is not available in the third cabins, which are slightly smaller. Each cabin is dominated by a large, swiveling executive chair that is enough fun that it could arguably be classified as part of the entertainment system. Upholstered in soft leather it can swivel between 135 and 270 degrees and recline up to 45 degrees. Controls in the armrest swivel the chair to positions for take-off, to look out of the cabin’s two windows or to watch the giant high definition screen. Or, you can just swivel. Also in the armrest: the chair recline buttons and controls to remotely position the 32-inch (81cm) monitor for the best viewing angle. Other controls reside on a wireless tablet that allows you to flip through the new MyKrisworld system while enjoying a glass of Dom or a repast on a table big enough to accommodate a minor feast. There ‘s plenty of storage including a full wardrobe and lots of compartments for the many knick-knacks, widgets and gadgets rich people apparently own. The two well-appointed bathrooms are also roomy with one sporting a vanity/dressing area. 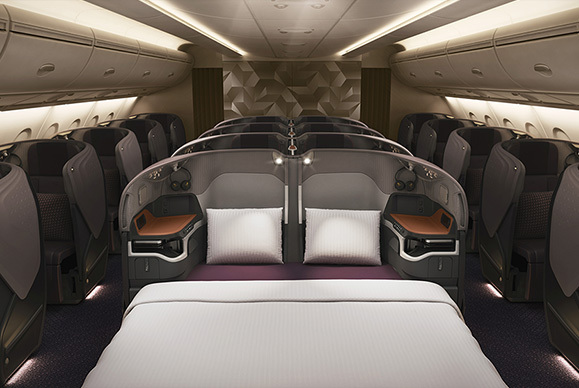 A separate 76-inch bed (193cms) can be made up before take-off so those who fly first class regularly can retire for the night while those who don’t continue playing with the seat and working their way through Singapore’s formidable first-class wine list. 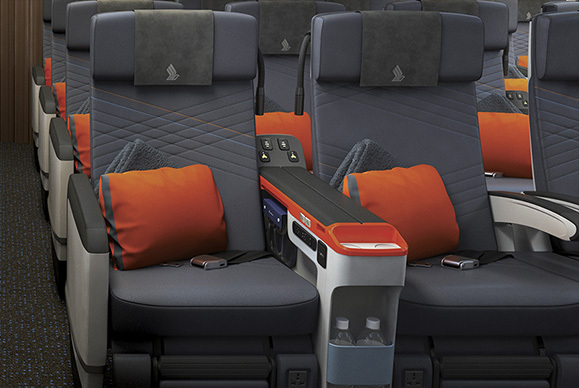 Some centre seats can be made into a double bed in business class. Making up the rest of the upper deck, this is still Tall People Territory but at a significant discount to the price of first class. Singapore has eschewed its extra wide original A380 business seat for an all-new seat that still has plenty of width at 25 inches (63.5cms). The seats are all forward facing and all command direct aisle access. Carbon composite construction means the airline has been able to provide extra storage space and cabin bags can now be put under the seat. It says many passengers are opting to do this rather than put them in overhead lockers above the window seats. The seat design also provides contoured privacy wings that make it impossible to see other passengers and are padded on the inside for extra comfort. There’s still an ottoman and the foot well is big enough to comfortably accommodate two size 14 feet, so stretching out is not an issue. All screens on the plane are now touch-enabled and long arms are an advantage if you want to operate the airline’s intuitive entertainment system that way. The high definition business class screen is 18 inches wide (46cms) and can also be operated by a small handheld control unit. There’s plenty of storage for bits and pieces and a slot for tablets or laptops next to the seat as well as a wide shelf where items can be parked. A peg gives allows you to get the noise cancelling headphones out of the way when moving in and out of the seat. Seat controls are within easy reach and include controls for the mood lighting and to turn the TV on and off. There’s an ajustable reading light and device charging options that include AC power and two USB ports. Innovative flip down armrests are added comfort aid and the swing-out table can be positioned for greatest convenience while being used in full or half mode. Singapore has opted to retain its diagonal sleeping system and the bed, which we didn’t try, is a fortuitous — at least in my case — 78 inches (198cms) long. The divider can be dropped in some center seats to form a double bed and in all of them to allow co-workers, spouses or family members travelling together to communicate . One minor problem was the need to bend to one side while walking down the cabin with the overhead lockers open. Premium economy seats have a generous 38-inch seat pitch. Singapore was a relative late-comer to premium economy and is finding it a popular option. Your correspondent had no problems with this seat, which has a generous 38-inch (96.5cms) seat pitch and allows full freedom of movement even with the seat in front fully reclined. At 19.5 inches (49.5cms) wide with good sized armrests between seats, passengers shouldn’t have to engage in unseemly skirmishes for elbow room or feel cramped at shoulder height. This is the ideal seat for tall people who can’t justify business class but who don’t want to put up with the rigors of economy class and are prepared to spend some extra dollars. It can be more than twice the cost of an economy sale fare but half the cost of a business seat. The premium economy cabin comes in a 2-4-2 configuration so half the travelers will have to clamber over somebody to get to the aisle. But it is at the front of the plane on the main deck in a quiet zone normally reserved for business or first classes. There is also better food and drinks, including the airline’s “Book the Cook” service which allows people to select from a wider menu before the flight. If 14th-century author Dante were to write his Divine Comedy today, Inferno would undoubtedly include another circle of hell full of tall people in economy class seats. Luckily, Singapore has resisted the trend to cram more people into smaller seats with this redesign: it still gives travelers a 32-inch (81cms) seat pitch and a width of 18.5 inches (47cms) in a 3-4-3 layout. Tall people will find this acceptable and better than many other economy class experiences, particularly when combined with Singapore’s service and the distraction of a high-definition 11.1-inch (28.2cms) touchscreen. There’s in-seat power, storage space for small items, a non-intrusive reading light and a six-way adjustable headrest with foldable wings. Long-legged beasties will be able to stretch out their legs underneath the seat in front of them regardless of its position. However, there are problems with having long legs in the 90-degree position when the seat in front is fully reclined. The adjustable footrest can also be an irritant, even if stowed, and it would be nice to have the option of removing it completely. Overall, though, this is one of the better choices for tall economy travelers and there’s always the option of shelling out a little more for an exit row. Fares vary widely according to factors such as travel dates, passenger loads and competitive pressures. Basically, the best thing to do is put your travel dates through our Skyscanner-powered booking engine and have a look yourself. Economy Lite sale fare: $A1278 ($US997). It’s worth noting that if the cheaper tickets in economy class have sold out, the cost of upgrading to premium economy may be only $A700 or $A800. We saw one Sydney-London return itinerary selling economy at $A1634 and premium economy at $A2,336. That’s well worth the additional cost. Previous articleHawaiian switches to 787s.